Quite an obscure choice of verse to study today, isn’t it? Deuteronomy 33 records Moses’ prayer for the Israelites tribe by tribe, and his blessing for the tribe of Reuben was undeniably shortest of all – in fact, it was almost a plea for mercy, a prayer of intervention by Moses rather than a prayer of blessing. But blessing it was, and at least Reuben was included. Simeon, the second son of Israel, wasn’t even included in that list. In my church we’re looking at Genesis recently, and having arrived at the very end of the first book of the Bible, someone asked casually, why was the tribe of Levi so used by God despite the sins of Levi and despite Levi missing out on the blessings of the firstborn? We know that the rights of the firstborn were denied to the firstborn Reuben (who we’re going to look at today), and went straight to the sons of Joseph [1 Chron 5:1-2]. In fact, Jacob’s blessings of strength, which would have been Reuben’s, skipped passed the next two eldest sons, Simeon and Levi for their treacherous act in slaughtering the Shechemites in vengeance [Gen 34:1-31]. It was given to Judah, who was a sinner as well, but notably repented and was sanctified. Now it’s quite commonly known that the Levites stood on the side of Moses during the incident of the golden calf [Exo 32:26] and was subsequently blessed, whether for that or for the fact that Aaron (and Moses) came from their tribe [Num 18:6], even though the curse of Jacob still holds through, and they held no land (except towns) and were scattered throughout Israel. To some extent I’m also aware of the plight of the Simeonites, who were not only scattered as a people, but even when they received land, it was out of the territory of Judah [Joshua 19:9] – the leftovers of Judah, in a sense. Yet I was never very clear about the plight of the tribe of Reuben in the Old Testaments, who was also given a curse by Jacob, so I took some effort to look into it. In this study we will look at the tribe of Reuben beginning from the story of Reuben, the firstborn of Jacob, and how important it is to weed out spiritual instability in our lives. 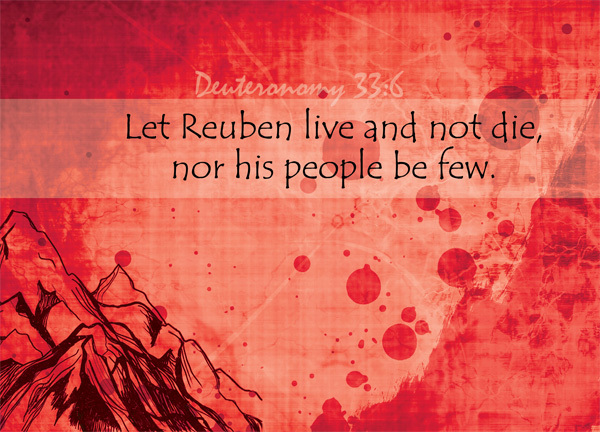 Let Reuben live and not die, nor his people be few – Reuben dwindled in numbers and became one of the smaller tribes of Israel (according to the Second Census) [Num 26] – what a plight! As the firstborn of Israel he was technically, by the right of his birth, supposed to receive double portion of his inheritance and double portion of Jacob’s blessings. As firstborn, he was supposed to be ‘my might, the first sign of my strength‘ of Jacob, and excelling in honor, excelling in power [Gen 49:3]. Recall the story of Joseph, and when all of Joseph’s elder brothers were jealous of him and wanted to kill him, Reuben was the one who stopped them – the only one with the intention to bring Joseph back to Jacob [Gen 37:21-22]. When he found out that his brothers sold Joseph while he was away, he tore his clothes [Gen 37:29-30]. Perhaps at that point he was honorable, perhaps at that point he seemed fitting to be regarded as the might and strength of Jacob, perhaps at that point he was excelling. But things changed. He was firstborn, but the right to the blessing and the inheritance of the firstborn passed him by because of his sin against his father by defiling his father’s couch, and his sin against God in such sexual immorality. Jacob’s last words for him were, turbulent as waters, you will no longer excel [Gen 49:4]. Indeed, he no longer excelled. Not one king, judge or prophet came from the line of Reuben (it should be noted that some scholars support the argument that the first of the minor prophets, Hosea, was from the line of Reuben – though the Bible makes no mention of it). The tribe of Reuben, along with the ten other tribes of Israel other than Levi, refused to stand on the side of Moses during the incident of the golden calf. Towards the end of the 40 years of exodus, Reuben was, along with Gad, the first tribes to ask for their land, not wanting to cross the other side of the Jordan [Num 32]. They had large herds and flocks [Num 32:1], but perhaps the Reubenites allowed that to hinder them from following the path of God. For this same reason, the tribe of Reuben did not answer Deborah’s call to arms for the wars with the Canaanites during the time of judges [Judges 5:16]. Feeling safe and secure in a place away from God, the Reubenites mistook a false sense of physical security as spiritual security. Just like their forefather, Reuben, did. Let us ponder a little bit and speculate a little bit on what went wrong for Reuben. What happened to this man between the time when he tried to save Joseph and when he defiled his father’s couch? The Bible didn’t tell us. There was no details about Reuben’s story – unlike Judah – all the Bible stated was his act, and that his father knew about it [Gen 35:22]. Reuben was his father’s firstborn, and when Jacob dies, his inheritance would be great. He could afford to feel extremely secure, for he was well-accounted for, being the firstborn of a patriarch like Jacob. Perhaps in that physical security and comfort, he had lost track of his spiritual stability and lost his self-control. He sinned against his father, he sinned against God. It was a sin that cost him much. His rights as firstborn were given to the sons of Joseph. The right of his bloodline to become rulers over the other tribes went to Judah. The right of his descendants to become priests and perform God’s sacred works went to Levi. He was left with nothing, not even a blessing, but a curse from his father. Turbulent as waters, you will no longer excel. Even so, Moses remembered Reuben, and blessed Reuben. It might not be the greatest blessing on a tribe – in fact, it was probably the least; but Moses remembered Reuben, and he blessed Reuben. Despite Jacob’s curse still standing true; Moses blessed Reuben to continue to survive, to live on and not dwindle in numbers (like Simeon). In their own way, the tribe of Reuben would continue to prosper – yet without excelling. Despite the sins of Reuben, despite the sins of the Reubenites, great is the mercy of the Lord, for he still blesses them through his servant Moses. Great is God’s mercy, for ultimately, according to Ezekiel’s prophecy – in the Messianic Kingdom or the New Land or whatever you prefer to call it, Reuben will have one portion too [Eze 48:6]. Well, even Simeon has one portion, how amazing. Great is God’s mercy. Let us learn from the mistakes of Reuben, the firstborn of Jacob, and the Reubenites. Let us not be overly comfortable in our physical or earthly stability and security, but instead constantly look to God for spiritual security and stability.